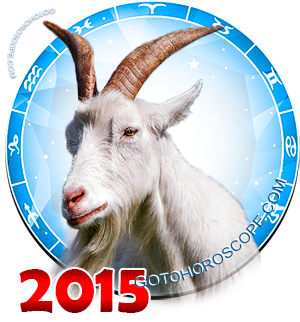 June 2015 Horoscope Capricorn, free Monthly Horoscope for June 2015 and Capricorn Astrology Forecast for the month ahead. June 2015 will be a curious time for the zodiac sign of Capricorn, the general energetic background of which will be connected with the position of three planets - Mars, Moon, and Jupiter. In fact, the Moon and Jupiter will significantly reinforce their negative emanations, since the Moon is responsible for the expulsion and Jupiter for the fall of this sign. However, the energy of Mars will stand in the way of these confident waves of negative planetary energy. Mars is traditionally the planet-exalt of Capricorn. The Red Warrior will also be reinforced due to several key combinations of the current period. As a result, the energy of Mars will be strong enough to fully supress the sum emanations of the Moon and Jupiter. In the end, Saturn will be the only one influencing the lives of Capricorns, being its planet-ruler. 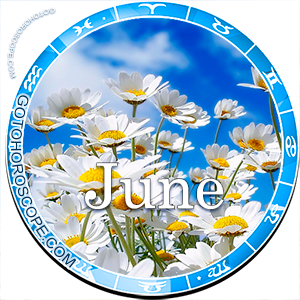 That means that June will become a curious time precisely because the people born under the Capricorn sign will not experience practically any planetary influence - not positive, not negative. Since despite being beneficial, the emanations of Saturn will not be all that strong. This leads to an absolute value of choice on one side and to a heightened dependency on circumstances on the other. 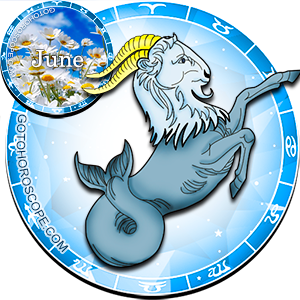 Speaking of the word direction, in June 2015 the Capricorns may grab a number of projects at once and towards the end of the month realize them 100%. Or they could take just one project and bring it to such a fantastic conclusion that others could not dream of! In either case, you will currently have enough strength and time to overcome any task. Another question is what you will select as your main goal, as that will be fully up to you, even if you are a line employee usually lacking the ability to choose. If you have your own business, then the spectre of your capabilities will only be limited by your imagination, just remember that you will not have serious stellar support right now and all of the responsibility is going to fall on your shoulders to the fullest degree. Perhaps, someone will be stopped by this fact, so you should be capable of truly evaluating your strength, since in the end you may fall short if you are lacking in confidence or competency in a particular area. You can only be recommended to account for the experience of others, to learn from those who are actually good at their job. No matter what, do not get offended by objective critique, even if it comes from your subordinates. The love front will see a similar situation in June 2015. There will be no outstanding situations, so you can relax and just go with the flow. Alternatively, you can take the situation into your own hands by fully realizing the responsibility and the possible results of your actions, and yet still decide to do something big. Be attentive and learn to feel the world a little more intuitively than you are used to. Perhaps there is a person beside you that can teach you how to do that. In your relationship with your lover concentrate on getting rid of even the smallest signs of mistrust. Do not let your jealousy control your thoughts and actions no matter what, as such things bring relationships to destruction. Act openly and sincerely among friends and if needed, then help those who really require your help. Although you should not force them to take it, altruism is only good when it is needed. As for the rest, concentrate on your feelings, learn to understand yourself and then the world around you will change radically and you are likely to see many new opportunities. Good....i m worried about my 12th hsc board exams...plzzz help..